There are hot wings and there are hot wings, and these come out smashing if you've got the time to prepare them. I make them for dinner sometimes, but they're best made for the big game, to be honest! First thing, heat your oil. Put that sucker on high, and just let it stew while you chop your chicken wings. Chop off the tips of each chicken wing and throw them away. Then cut each wing in half at the joint. Season the bunch with salt and pepper. 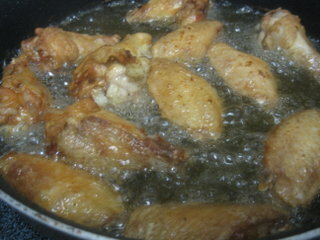 Fry the wings in the oil until they are golden. Put on T.V. for your kids because they CANNOT be in the kitchen for this one. Remove them to a plate covered with a couple of layers of paper towels to drain the oil. Then place them in a large bowl. 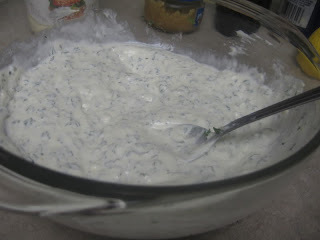 In a small saucepan, heat the butter over medium heat. (I used a frying pan because I didn't have a saucepan that was clean). Add the hot sauce and vinegar. Add the sauce to the wings in the bowl. 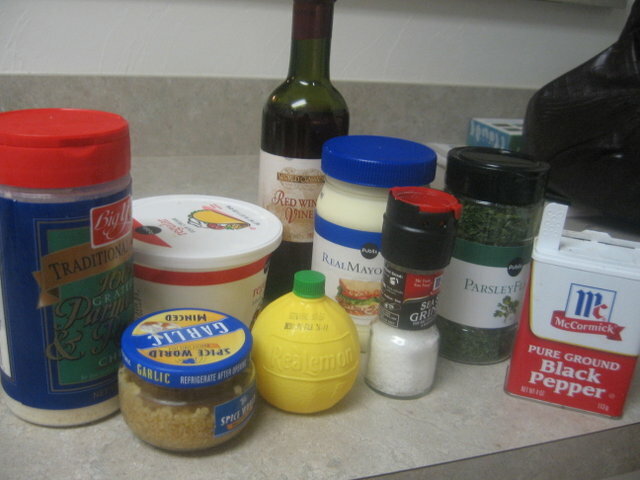 In a small bowl, add all the ingredients together. Gently stir together until well mixed. 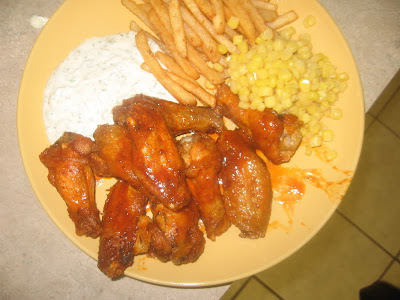 yum - my hubby loves wings but I haven't tried them at home yet. I'll have to give this a shot. I bake my wings. Typically I marinate them in a pre-bought wing sauce (I've only found one I like) for at least 2 hours, most of the time I do them in the morning and start cooking around 4pm. I bake them on a cookie sheet for 45 mins. Take them out drain the grease off and wipe down the pan of any excess grease, spray with non-stick spray and throw them in for another 30 to 45 mins based on how crispy you like them. Pull them out and coat them in more wing sauce and serve. No oil frying, still awesome. 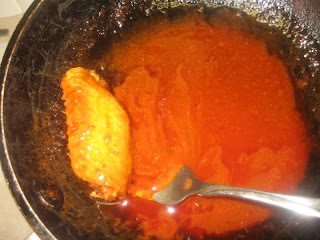 I make bbq wings too but they they are made a little differently otherwise the bbq sauce just burns.